The Spreadsheet to ASP/ASP. NET converter can quickly create ASP and ASP.NET pages using Excel. 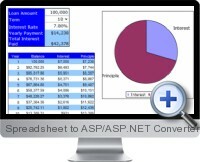 An Excel spreadsheet can be designed and created including all necessary calculations for the Spreadsheet to ASP converter to generate the ASP page or the ASPX page. The resulting page can be used as it is or opened in Visual Studio for further processing. Back-end integration can also be added such as for saving and restoring the values to a database. The ASP.NET-page can either be stand alone or part of a larger application. Suitable for non-programmers - turns business users' Microsoft Excel spreadsheets into scalable ASP.NET applications. Flawless number formatting: If you set the format in Excel, all entered data is directly formatted. For example if the users enters '20' into a field with 2 decimals, it will be replaced by '20.00', and if the user enters '7' into a percentage field, it will be replaced by '7%'. Easy to use web pages: Create forms with drop down menus, check boxes, radio buttons, large text fields, list boxes by using the form controls in Excel. Once the web page is created, Excel is not required. Your web server doesn't need to run Excel, and your users don't need Excel to use the online application. 170 Excel functions: Currently all but a few advanced financial and statistical functions are supported. Formulas protected: All calculations are done on the server and formulas are totally hidden from the end user. No Risk - 30 day money back guarantee and 6 month email support. Quick testing: Built-in edit, debug, compile, test cycle for IIS, so if you have IIS locally installed, you can see the result directly. Works on old Windows servers; Supports NT4, Windows 2000, Windows XP, Windows 2003. Does not require the Microsoft .NET framework.